I can’t hear the word ‘beer‘ without thinking back fondly of Frankenstein’s in Boston. Just one block’s trot from my student flat. I could eat dinner there for just $1. It was 1987, true, but $1? The hotdogs, the only food served in this funky bar, were ginormous (gigantic and enormous). The toppings were practically a meal in themselves–an overwhelming array of sauerkraut, baked beans, corn kernels, hot peppers and multiple sauces. Those were the pre-heartburn years. There were over 100 types of foreign beer on the menu, but I always ordered Pilsner Urquell. I liked saying Pilsner Urquell–It sounded so exotic and grown up and I really, truly appreciated its taste. While you’re contemplating reaching for an icy cold beer with Frankenstein’s in mind, try to imagine how well this Delectable Hummus Appetizer atop Spiced Pita Chips would enhance the Pilsner of your dreams. Just like the toppings on Frank’s dogs, the finely chopped veggie bits help make this snack food more nutritious and calorie-friendly. If using dry chickpeas, soak overnight in a large bowl of cold water with 1/2 tablespoon of baking soda. Drain, rinse, cook covered, with 1″ water above the chickpeas, and 1/4 teaspoon of baking soda, on low heat, for 30 minutes, then allow it to rest covered for an hour, until the chickpeas are soft and evenly yellow when cut through. Finally, uncover and allow to cool completely before puréeing. The home cooked chickpeas were soft enough to be stirred with a fork, saving time and energy in clean-up. If using canned chickpeas, blend them in a blender or food processor. Add tahini, lemon juice, garlic, salt, and water (if required) until the ingredients form a smooth consistency. Taste to adjust the amount of salt and lemon. Scoop the mixture into a large bowl and add remaining ingredients, excluding small amounts of each to be added on as garnish. Taste, adjust the amount of lemon and salt, then refrigerate. 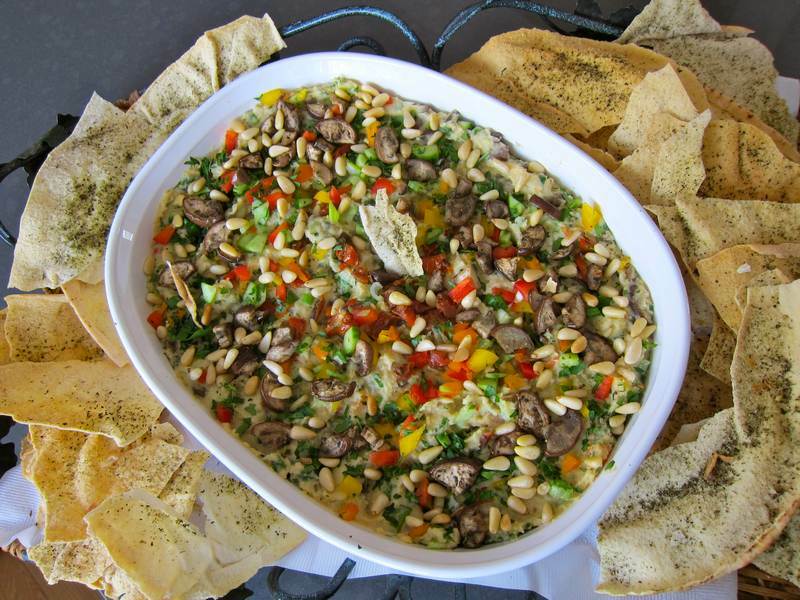 Serve chilled in a shallow casserole surrounded by Spiced Pita Chips. 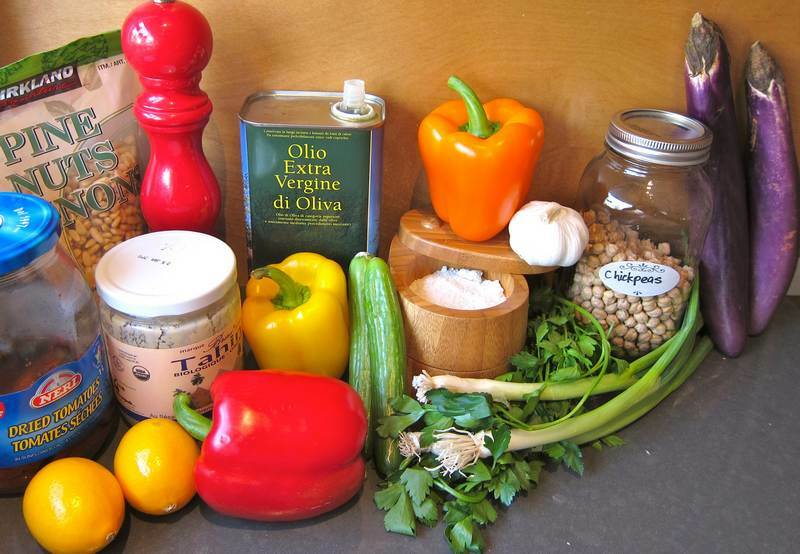 It is best to use a spray bottle that you can fill with your own olive oil, (Pampered Chef makes a good one). Spray a thin coating of oil on the halved pita. Sprinkle on the seasoning. Bake one at a time on two cookie sheets at 350 degrees, keeping an eye out so as not to burn the thin pita. It takes about 12 minutes per pita. 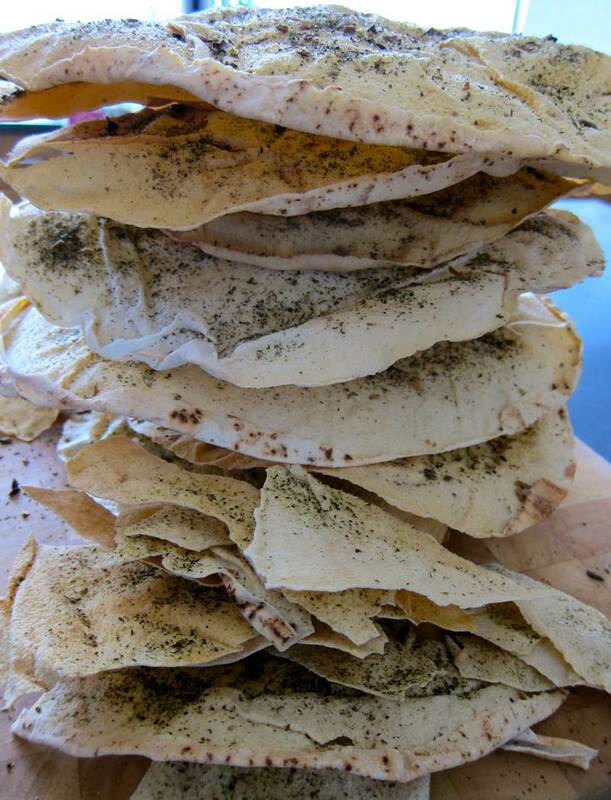 This Spiced Pita Chip recipe is one that my mom has been making for years, with great success. We nibble on these crispy crackers alongside soups, salads and dips. Save the bag that the pita comes in for storing the uneaten baked chips. Did you know there are 32 hummus recipe variations, including peanut butter? Now there are 33. Did you know there are 12 ways to make guacamole? This post was inspired by the insanely gorgeous blog, Spoon Fork Bacon, of which I am decidedly and unashamedly jealous, for obvious reasons. Read all about the $100 Dragon dog, the most expensive hot dog in the world. Thanks Holly. Have a nice weekend!